The first ever Gothenburg summit, attended by HRH Crown Princess Victoria of Sweden, saw progressive announcements to tackle the plastic crisis from the Swedish Government and Volvo Cars. Karolina Skog, Swedish Government Minister for the Environment, revealed that the Swedish Government has allocated €7.8 million to 15 projects related to Ocean health at the event in the Volvo Ocean Race Village. Karolina Skog said: “The Swedish government has decided to allocate the funds to specifically work on projects that focus on addressing plastic pollution, ocean acidification, the destruction of coral reefs, education and Ocean Science. We want to use the information that is coming out of the scientific community and put it into political policy. She said the Swedish Government is also considering legislation to make the plastic waste trade more transparent. And in a first for car manufacturers, Håkan Samuelsson, President and CEO of Volvo Cars, announced the company’s ambition that from 2025, at least 25 per cent of the plastics used in every newly launched Volvo car will be made from recycled material. A Volvo XC60 made partly from recycled plastics was unveiled at the Ocean Summit. Volvo Cars have also signed up to the UN Environment #CleanSeas campaign, which partners with the Race with the aim to encourage governments, businesses and individuals to make changes in their own lives to reduce their plastic footprint. Håkan Samuelsson said that by working with the Volvo Ocean Race Science Programme, which collects data on microplastic levels from Turn the Tide on Plastic and Team AkzoNobel boats, they are helping spread the message that the plastic problem has to be solved. The special XC60’s interior has parts made from renewable fibres and plastics from discarded fishing nets and ropes. Used car seats from old Volvo cars were used to create the sound-absorbing material under the car bonnet. On the stage, Kristofer Sundsgård, Managing Director, Stena Recycling, said that the company has a responsibility to drive innovation and have built a state of the art recycling centre where they can recycle 95 per cent of a car. The topics discussed, at the half-day event, included the science of Ocean plastic pollution and the impact on human health, the imperative for business engagement and investor support for the emerging blue economy. Volvo Ocean Race Ambassador for Gothenburg and Turn the Tide on Plastic crewmember Martin Strömberg joined boat Skipper Dee Caffari, and Charlie Enright, Skipper, Vestas 11th Hour Racing in a discussion about plastic pollution and making the sport of sailing more sustainable. 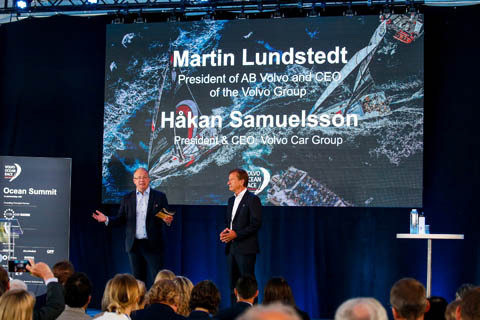 Other speakers at the event included Martin Lundstedt, President and CEO, Volvo Group, who said the company is moving towards a target of zero waste going to landfill. The audience heard from Jan Eliasson, former Deputy Secretary-General of the United Nations and Chair of Stockholm International Peace Research Institute Governing Board, Marcus Eriksen, Co-Founder of the 5 Gyres Institute, Anders Jacobson, President Bluewater, Co-founder & CEO Blue and Håkan Wirtén, Secretary General of WWF Sweden. Ivone Mirpuri, Medical Advisor Mirpuri Foundation, Principle Sustainability Partner of the Volvo Ocean Race, offered expert insight into how microplastics are impacting on human health. Lisa Svensson, Director Oceans, UN Environment offered the closing remarks, calling for sustained action to restore Ocean health. Ocean Summits in Alicante, Cape Town, Hong Kong, Newport, Rhode Island, and Cardiff have already resulted in governments, business and a range of ocean advocates leading by example by making solid commitments to help stop the ubiquitous spread of plastic in our seas. 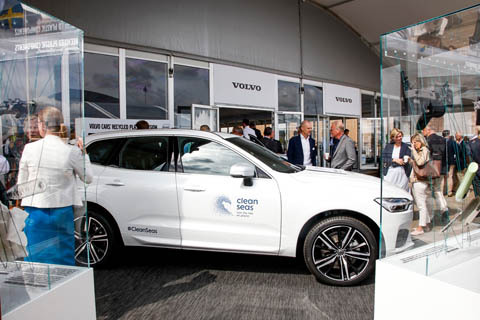 Last month at the Ocean Summit at the Newport stopover, Volvo Cars committed to eradicate single-use plastics across all its premises and events by the end of 2019. 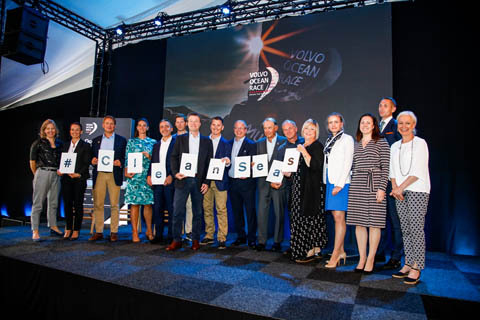 Volvo Car also used the innovative conference to announce they are signing up to the UN Environment #CleanSeas campaign. Anne-Cécile Turner, Sustainability Programme Leader, spoke about the Race’s commitment to embedding sustainability at its heart.